Super Savings Item! 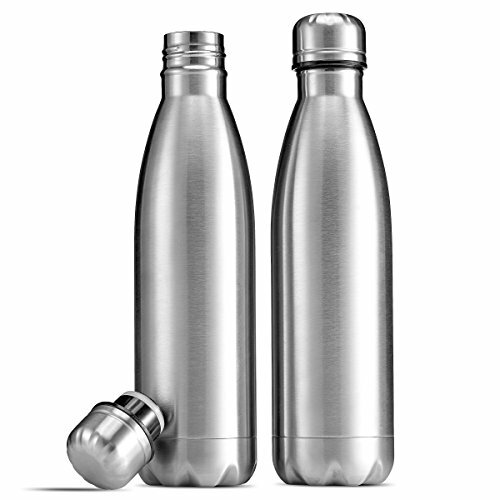 Save 34% on the FINEDINE Stainless Steel Water Bottle - Set of 2 (17-Oz.) Double-Wall Vacuum Insulated Water Bottle, Keeps Drinks Hot for 12 Hours, Cold for 24 Hours BPA FREE Rust Proof, Sweat Proof, Leak Proof by FINEDINE at Kerinci. MPN: FD-S401. Hurry! Limited time offer. Offer valid only while supplies last. The FineDine stainless steel water bottle set of 2 features double-walled 18/8 gauge heavy duty metal that's vacuum sealed with an inner stainless steel lining and a leak-proof twist on lid that increases thermal insulation allowing beverages to stay hotter or colder for longer. The insulated water bottles keeps cold drinks chilled for at least 18 hours and hot drinks hot for at least 10 hours while the outside remains thermally unaffected. Condensation never appears on the steel bottle ensuring a secure grip, dry fingers, and no need for a coaster. These reusable bottles are great for hiking, biking, the gym, travel, school, work, and just about anywhere you might get thirsty! A 1 ¼" diameter mouth accommodates small ice cubes and chopped fruit. It's slim, sleek body fits in standard cup holders making the hiking bottles convenient for taking on the go in the car, bike, or back pack. These reusable water bottles have a specially designed vacuum-seal cap that aids in maintaining desired temperature of contents while also preventing spills for a leak proof seal that won't soak gym bags or purses. A flat, stabilized bottom keeps the reusable bottles flush on table and countertops. Our lightweight yet rugged metal bottles are made of virtually indestructible, rust proof stainless steel for a water bottle that's tough and reliable. The thick gauge steel resists bumps for ultimate dent resistance. Dimensions: 10 ¾" height, 17 oz capacity. If you have any questions about this product by FINEDINE, contact us by completing and submitting the form below. If you are looking for a specif part number, please include it with your message.